What do the main characters in all these stories have in common? An unwavering and absolute TRUST in the God they serve. A belief that their God would show up and do something on their behalf. Sometimes we read stories like this and wonder how someone could ever get to a place where they could trust God like that?? With their very lives. Or, in some cases, the lives of an entire nation or people group. And yet all of these stories are threaded with many little moments of trust, leading up to their one great awe-inspiring decision to trust God in the face of overwhelming odds. 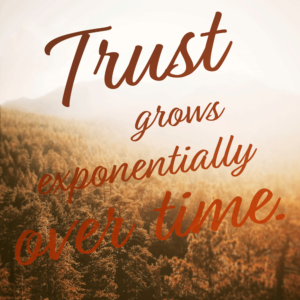 Trust grows exponentially over time. When we decide to trust God in small areas of our lives and we are able to see His faithfulness to us, our trust grows. And each trust step we take, leads us deeper and deeper, allowing us to trust Him with even harder and more difficult areas of our lives. Trusting is a daily act of surrendering our will to His, trusting His plan over ours and acknowledging his faithfulness to us. The dictionary definition of trust is this: a firm belief in the reliability, truth, ability, or strength of someone or something. Gideon had a firm belief in the strength of God to help him win in battle. Esther had a firm belief in the truth of God to reveal Haman’s evil plot to extinguish the Jews. Abraham had a firm belief in the reliability of God to provide another sacrifice. 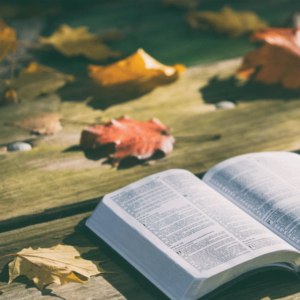 All were able to trust in the midst of dire circumstances because they had learned from previous experiences that the God in whom they placed their trust was indeed able to be trusted. He had proven himself. He had come through for them before and He would do it again. Sometimes we are prone to forget the many ways that God has come through for us in the past. But, if we want to be people who trust God, then we also need to be people who share our stories of God’s faithfulness with one another. Because as we share, our faith increases. And so does our trust. This week, let’s take another trust step forward and determine to give Him complete access to a new area of our lives. Whether that might be trusting Him with our kids, our finances or maybe our health. Let’s remember all the ways that He has been faithful to us in the past, and let it fill our hearts with trust going forward.